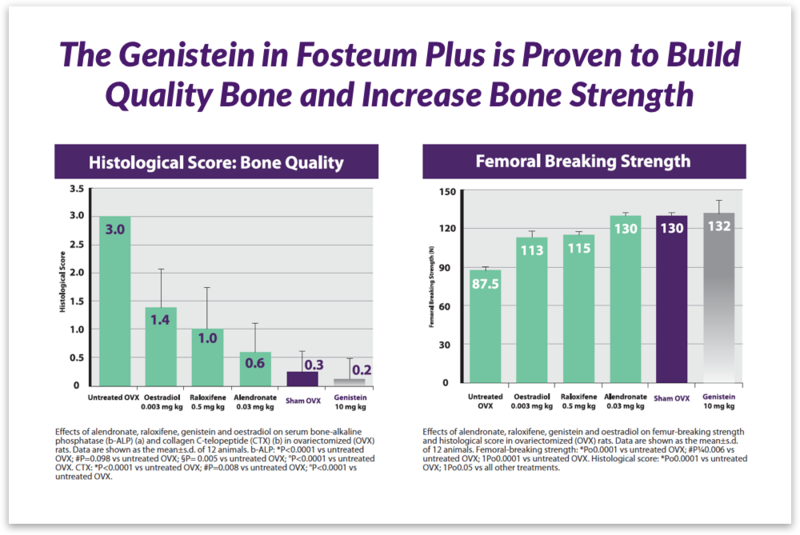 Fosteum Plus is a prescription medical food that safely and effectively builds quality bone by delivering a complete bone-building system with the combination of genistein (from a non-soy source), zinc, calcium, Vitamin D3 and Vitamin K2. These high-quality ingredients work synergistically to build quality bone and manage bone loss. Fosteum Plus is for the clinical dietary management of the metabolic processes associated with osteopenia and osteoporosis. Fosteum Plus is indicated when a healthy diet and supplements such as calcium and Vitamin D are not enough. 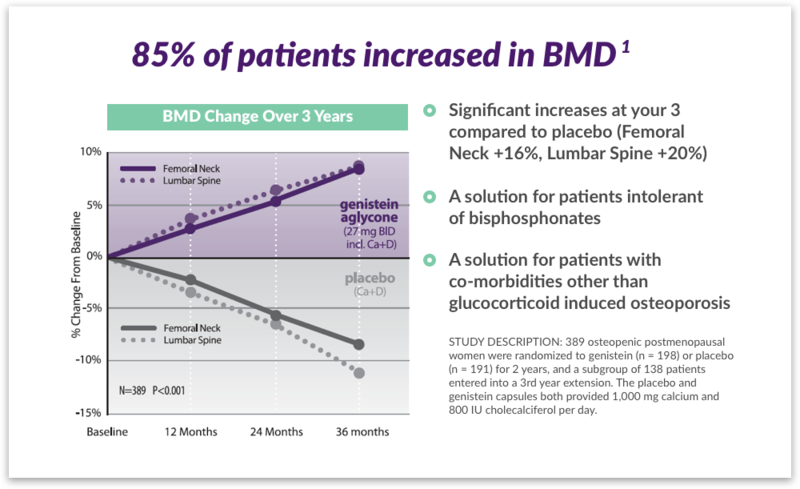 In fact, patients taking Fosteum Plus had an increase in bone mass density (BMD) by 9% over 3 years when compared to only Calcium and Vitamin D3 alone. Genistein acts at a number of points in the bone remodeling cycle to decreases the number of mature cells that break down bone and increases to number of cells that build up bone. Studies have shown that zinc and genistein work synergistically, and more effectively than either zinc or genistein alone. New bone mineralization uses calcium and phosphate at a molar ratio of 1.6 calcium molecules for every phosphate molecule. Fosteum Plus contains the correct molar ratio of calcium to phosphate that approximates this number. Vitamin D assists in the proper absorption of calcium and phosphate from the upper intestine and the use of absorbed minerals in the mineralization of bone. As ‘100% trans’ (natural) MK-7 crystals, this is the form demonstrated to increase bone formation and decrease deposition of calcium in arterial walls. Osteopenia is a classification for bone loss that is a precursor to osteoporosis. Someone with osteopenia has a lower bone density than normal, but not low enough for an osteoporosis diagnosis. Osteoporosis is a more serious condition that leaves bones fragile and prone to breaks. You may not know you are losing bone mass in the early stages of osteopenia because it doesn’t typically produce symptoms. However, if it progresses to osteoporosis you may develop back pain, a loss in height, and bones that easily break. Osteoporosis can limit physical activity and have a negative effect on overall health, happiness and quality of life. Doctors diagnose the condition by measuring your T-score. Higher, positive numbers usually mean stronger bones. Negative numbers mean your bone density is lower than normal. A score between -1.0 and -2.5 indicates osteopenia or low bone mass. A score lower than -2.5 indicates osteoporosis. How are menopause and bone loss linked? 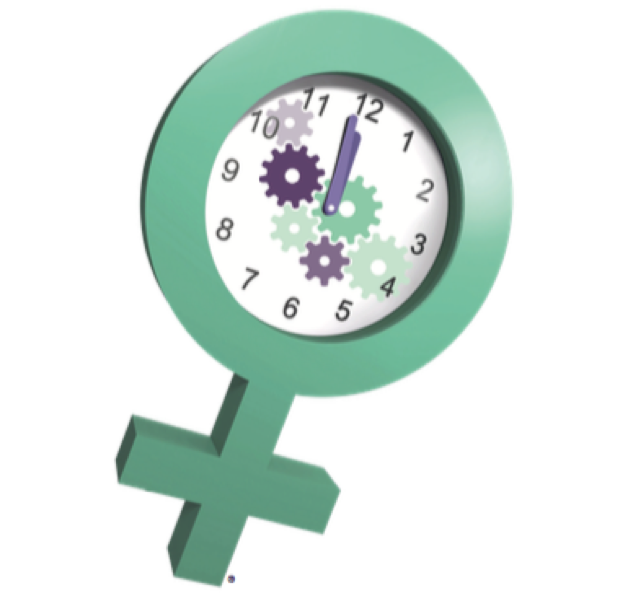 Numerous clinical research studies demonstrate that early bone loss in women is linked to estrogen loss during menopause. The most bone loss occurs during the first two years of menopause. Fosteum Plus is a prescription medical food, developed entirely from natural ingredients, and used to manage osteopenia and osteoporosis. In clinical trials, Fosteum Plus showed significant increases in bone density (and T-scores) at the spine and hip compared to calcium and vitamin D alone. Fosteum Plus is a prescription medical food. The U.S. Food and Drug Administration (FDA) regulates medical foods in a separate category than drugs and supplements. Similar to drugs, medical foods help manage diseases and require physician supervision. Sound laboratory and clinical science must prove the effectiveness of a medical food. Dietary supplements are meant for healthy people and do not require a prescription. The term “food” speaks to the safety of these products because they must contain only ingredients that have been designated as GRAS (Generally Recognized as Safe), a strict food-safety standard set by the FDA. What are the key ingredients in Fosteum Plus? Fosteum Plus contains key bone-building ingredients including genistein, zinc, calcium, phosphate, Vitamin K2, and Vitamin D in a single capsule. It also contains dicalcium malate, pentacalcium hydroxide triphosphate, citrated zinc bisglycinate, trans-menaquinone-7, colecalciferol, micro-crystaline cellulose, magnesium stearate, silicon dioxide, and sodium copper chlorophyllin in a gelatin capsule with titanium dioxide as coloring. Fosteum Plus does not contain fructose, glucose, sucrose, lactose, gluten, maltodextrin, tree nuts, peanuts, flavors or products of animal or seafood origin. It is suitable for vegans if you open the capsule and sprinkle what is inside over soft food, such as applesauce. How does Fosteum Plus work? Fosteum Plus works on two levels. It is made of ingredients that build quality bone and the mechanisms needed to promote bone turnover and restore the process to its normal balance. It slows down the cells that break down bone and stimulates the production of cells and their activities that build bone. Does Fosteum Plus have any effect on hot flashes? In clinical trials, Fosteum Plus demonstrated a significant reduction in hot flashes over time. At 12 months, the frequency of hot flashes dropped by 57%, and the severity of hot flashes fell by 38%. In the same clinical trial, among women who experienced at least five hot flashes per day, 74% experienced improvement in the Fosteum Plus group versus none in the group taking calcium plus vitamin D alone. 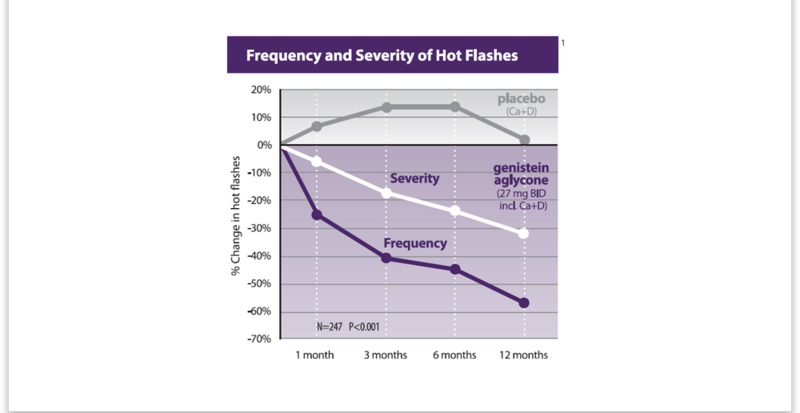 After two years, the hot flash number was about the same, but severity dropped by approximately another 30%. Does Fosteum Plus cause side effects? The most common side effect of Fosteum Plus is minor nausea or upset stomach. If this happens to you, take Fosteum Plus with food because it may reduce the chance of side effects. In clinical trials, women who took Fosteum Plus and those who took a placebo (calcium and vitamin D) had the same types of side effects. Who should take Fosteum Plus? Women at risk for bone loss can take Fosteum Plus during menopause, when estrogen is decreasing, and post menopause, after periods have stopped for a year and ovaries no longer excrete estrogen. Women who have had surgery to remove their ovaries may also take Fosteum Plus. It is an option for women who can’t take or tolerate other bone loss therapies. Who should not take Fosteum Plus? Do not take Fosteum Plus if you are allergic to any of its ingredients. Fosteum Plus is not intended for pregnant or nursing women, or women who are still producing estrogen and are of childbearing age. How should my patients take Fosteum Plus? Patients should take one capsule two times a day approximately 12 hours apart. Fosteum Plus can be taken with or without food. What if my patient misses a dose of Fosteum Plus? If your patient misses a dose, they should take it when they remember. If it is almost time for their next dose, they should wait and take the next dose on schedule. Can patients buy Fosteum Plus over-the-counter at a pharmacy or drug store? Fosteum Plus is dispensed by prescription. The FDA regulates it as a medical food product, which must be used under physician supervision according to federal laws. Primus Care Direct is a hassle-free, mail-order pharmacy service that saves time for healthcare practitioners by helping to increase fill rates and eliminate call-backs for prior authorizations. In addition to convenience for practitioners, Primus Care Direct also guarantees patients get their Fosteum Plus prescription for $49 for a 30-day supply or $117 for a 90-day supply ($39 per month), Medicare patients included. This is the lowest possible price available and includes free home delivery. If patients have insurance, they may pay even less. Find more resources and clinical support for Fosteum Plus.